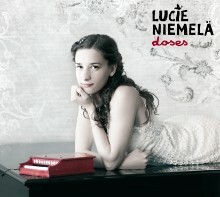 Bio: Lucie Niemelä is a Czech singer-songwriter living in Finland. She is known for her emotional performances, straightforward lyrics and adventurous melodies. Lucie (born 1985) grew up in the Czech Republic in a rough industrial neighbourhood. She got her piano when she was eight and began composing at the age of 11. She moved to Finland in 2004 to study Finnish language and culture. Soon she met great musicians and was able to play her songs that had waited in a drawer for years. Her first music project was lounge newjazz band Tune Toaster in 2006-2009. After moving to Helsinki Lucie started collaborating with Jaakko Laitinen ja Väärä raha. For those who understand a bit of czech language: the interview about Lucie´s first album starts in the middle. Helsinki, 10.06.2011: Lucie und Steph feiern den Vertragsabschluß für das Album "Doses"